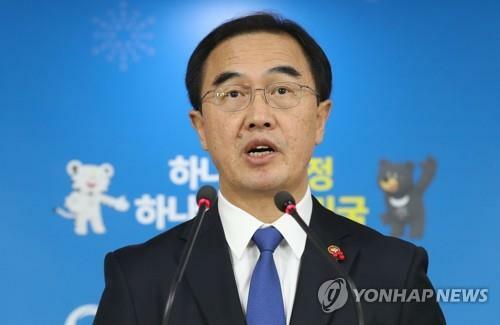 SEOUL, Oct. 24 (Yonhap) — Unification Minister Cho Myoung-gyon held meeting with defectors in Seoul on Wednesday where he apologized for his controversial decision to prevent a defector-turned-journalist from covering recent inter-Korean talks, a participant said. Cho had a lunch meeting with representatives of three North Korean defector groups at a Seoul restaurant to explain his position on the controversy and listen to defectors’ opinions on pending inter-Korean issues. The minister recently caused a stir by excluding a defector-turned-journalist of the conservative Chosun Ilbo daily newspaper from the pool of reporters covering high-level inter-Korean talks held at the truce village of Panmunjom on Oct. 15. The last-minute decision prompted a strong outcry from North Korean defectors and other journalists, who voiced concerns over possible violation of freedom of the press and discrimination against defectors in the workplace. It is the first time in one year and two months that Cho has met with representatives of defector groups in South Korea. Following the lunch meeting, the ministry sent a text message to reporters saying that various issues, including resettlement policy for new defectors and recent inter-Korean circumstances, were discussed at the meeting. The ministry also said the recent exclusion of the defector-turned-reporter from coverage of inter-Korean talks was also discussed.